Load Cells are commonly used to measure weight and, they can measure things as small as a needle to as heavy as big drilling machines. You can find load cells everywhere, even in your nearby grocery stores to weigh your items, though, they are inside the instruments. Load cells find their application in a variety of fields. 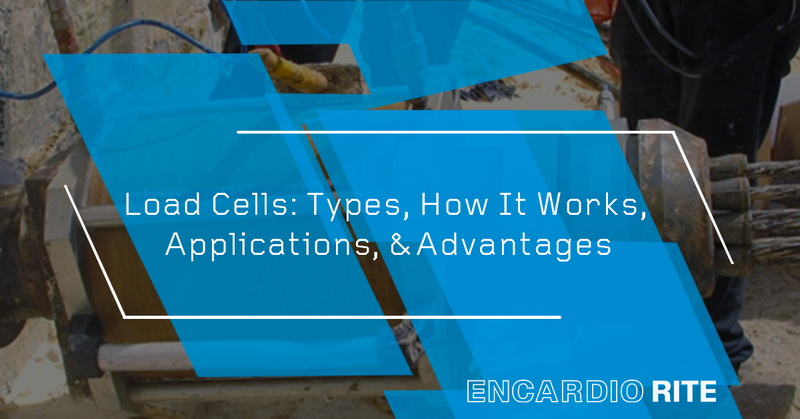 Let us discuss more about load cells, their types, working principle, advantages, disadvantages, and much more. Load Cells are a type of transducers that convert the force exerted on them into electrical readable units, similar to our regular weighing scales. But, load cells are always bonded along with elastic material, known as strain gauges. To understand load cells, it is necessary that you must know about strain gauges, their types, working principle, areas of applications, advantages and limitations. The Encardio-rite model ELC-150S-H load cell is extensively used for compressive load measurement during testing of piles. 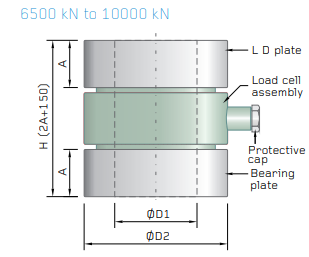 For testing of piles at loads greater than 12,500 kN, more than one load cell can be used. The Encardio-rite model ELC-150S-H is a resistive strain gage type precision engineered, high capacity load cell designed to measure large compressive load or axial forces. It is specially designed for civil engineering applications. It is available in capacities ranging from 5000 kN to 12500 kN. The compression strain gauge load cell comprises a columnar element of high strength martensitic stainless steel. The sensor utilizes sixteen 350 Ohm resistance strain gauges, wired to form a 1400 Ohm bridge. To minimize the effect of uneven and eccentric loading, the strain gauges are equally spaced along the circumference. The load applied to the cell can be measured by using any standard digital read-out unit suitable for resistance strain gauge applications. The load cell has great resistance to extraneous forces and is protected against dust, moisture and adverse environmental conditions. The sectional area of the element is varied in the different capacity load cells to give approximately the same millivolt output for a variation of zero to full load. The Encardio-rite model ELC-210S is a heavy duty precision load cell. It is specially designed to meet the increasing demand in load measurement with a high degree of accuracy and reliability. 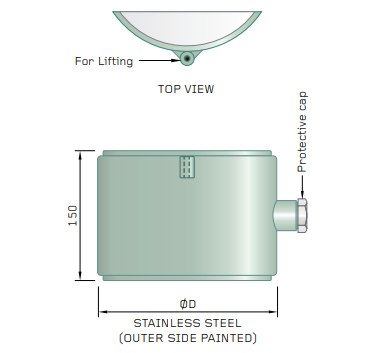 The load cell is ideally suited for measurement of compressive load or forces in struts application. It is available in capacities ranging from 1000 kN to 3500 kN. The internal construction of the load cell is columnar. The element of the load cell is made of martensitic stainless steel. The element is hardened to give better linearity and hysteresis. The strain gages used is of foil type and are bonded to the elements using special epoxy cements which are very reliable. The electron beam welded sensor utilizes precision bonded foil strain gages connected in a simple Wheatstone bridge circuit. The output is derived from imbalances in the bridge circuit as load is sensed by the sensor. Typically the bridge circuit is excited by 10 V DC to give a full scale output of around 1.5 mV/V. Load applied to the cell can be measured by using any standard digital read-out unit suitable for resistance strain gage applications. 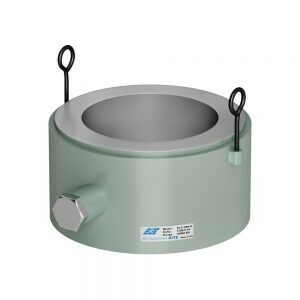 Encardio-rite model ELC-30S resistive strain gage type centre hole load cell is extensively used to determine the load in rock bolts, tiebacks, foundation anchors, cables or struts depending on the application. It is also used for compressive load measurement between structural members i.e. tunnel supports or at the junction between a beam and the top of a pile strut. 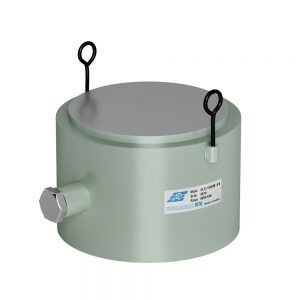 The Encardio-rite model ELC-30S is a precision engineered load cell with a central cylindrical hole. It is specially designed for civil engineering applications. It is available in capacities ranging from 200 kN to 2000 kN. The centre hole load cell comprises an element of high strength martensitic stainless steel. It uses eight 350 Ohm resistance strain gauges, wired to form a 700 Ohm Bridge. To minimize the effect of uneven and eccentric loading, the eight strain gauges are mounted at 45° to each other in a groove at the base of a stainless steel columnar element. The load applied to the cell can be measured by using any standard digital read-out unit suitable for resistance strain gauge applications. The strain gauges are mounted in a groove at the base of a stainless steel columnar element. A stainless steel diaphragm is electron beam welded to the element to cover the groove resulting in a vacuum of around 1/1000 Torr inside the sensor. All this helps in sensor becoming immune to atmospheric corrosion and the effect of ingress of water. The sectional area of the columnar element and the depth of the groove in it is varied in different capacity load cells to give approximately the same mV/V output for a variety of zero to full load. A load cell is used to determine the load in rock bolts, tiebacks, foundation anchors, cables or struts depending on the application. Encardio-rite model ELC-30SH is also used for compressive load measurement between structural members i.e. tunnel supports or at the junction between a beam and the top of a pile strut. 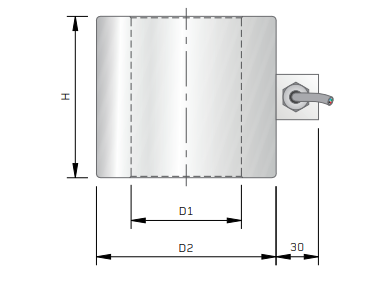 The Encardio-rite model ELC-30S-H is a precision engineered high capacity load cell with a central cylindrical hole. It is specially designed for civil engineering applications. It is available in capacities ranging from 3500 kN to 10000 kN. The centre hole load cell comprises a cylinder of high strength martensitic stainless steel. It generally uses eight 350 Ohm resistance strain gages, wired to form a 700 Ohm Bridge for capacity 3500 kN and 5000 kN. For capacities above 5000 kN, sixteen 350 Ohm resistance strain gages are used to form 1400 Ohm Bridge. To minimize the effect of uneven and eccentric loading, the strain gauges are equally spaced along the circumference. The load applied to the cell can be measured by using any standard digital read-out unit suitable for resistance strain gage applications. 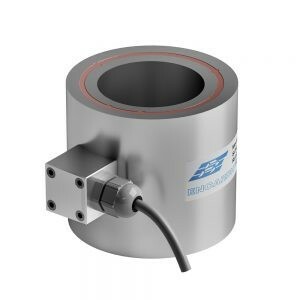 The Encardio-rite model ELC-31V is a precision engineered vibrating wire hydraulic centre hole load cell, specially designed for civil engineering applications. It is fluid filled and is constructed from stainless steel. It is available in capacities ranging from 250 kN to 2000 kN. The model ELC-31V vibrating wire hole load cell is made of a sensitive pressure pad which is formed by joining together two very stiff steel discs at their periphery. The space inside the cell is filled with de-aired fluid. When the load is applied to the cell, the pressure on the fluid changes. This change in fluid pressure is used to record the variation in the load being applied to the cell. The load is distributed equally over the loading area of the cell by a thick, distribution plate. Load distribution plates can be used both above & below the load cell to ensure an even distribution of load on to the cell. Bottom load distribution plates are not required if an adequate bearing plate has been incorporated into the proposed installation arrangement. The pressure in the load cell is measured by a vibrating wire pressure transducer. The vibrating wire pressure transducer is of stainless steel construction and incorporates the latest vibrating wire technology to provide electrical read-out. A glass to metal seal is provided for easy cable connection. The data from the vibrating wire pressure transducer can be read by Model EDI-51V read-out datalogger. The data can also be remotely read by model EDAS-10 automatic data acquisition system. 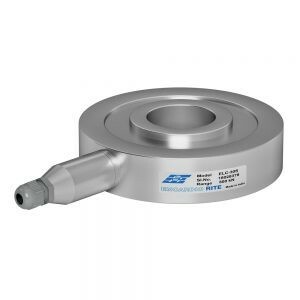 The Encardio-rite model ELC-32V is a precision engineered load cell with a central cylindrical hole. It is specially designed for civil engineering applications. It is available in capacities ranging from 250 kN to 3500 kN. Higher capacity load cells and those having an internal diameter different from the standard specified range are available on request. 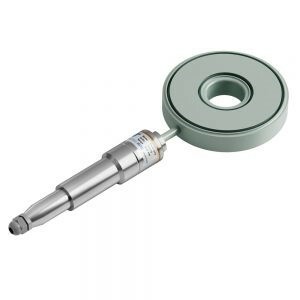 The centre hole load cell comprises a cylinder of high strength martensitic stainless steel. It generally uses three vibrating wire strain gages mounted at 120° to each other to minimize the effect of uneven and eccentric loading. The load applied to the cell is measured individually by the vibrating wire strain gauges using Encardio-rite model EDI-51V digital read-out unit for vibrating wire sensors. The average of the three readings is taken. 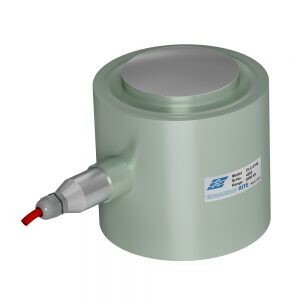 Alternatively, the load cell can be connected to Encardio-rite model EDAS-10 data acquisition system for continuous monitoring. If specifically required, the load cell can be provided with four or six vibrating wire strain gages. Pneumatic Load cells are designed as such that the balancing pressure is automatically adjusted by them. When air pressure is applied to one end of the diaphragm, it releases through the other end/nozzle, at the bottom of it. A pressure gauge attached to the load cell measures the pressure inside the cell. The deflection of the diaphragm changes the airflow through the nozzle as well as the pressure inside the chamber or diaphragm. Piezoelectric load cells work on the same principle as that of the strain gauge load cells but, the voltage output is generated by piezoelectric material which is proportional to the deformation of the load cell. 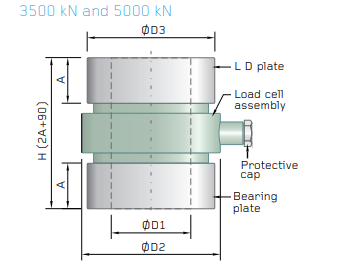 The Piezoelectric load cells find their application in the areas of dynamic loading where strain gauge load cells often fail with high dynamic loading cycles. The piezoelectric effect is dynamic, which means, the electrical output of a gauge is a non-static impulse function. The voltage output is useful only when the applied force or strain is changing and does not measure static values. Load Cells can’t work without being paired up with specific sensors, one of them being Strain Gauges. Strain Gauges are thin elastic material made up of stainless steel material and are fixed inside the Load Cells using proprietary adhesives. The strain gauge has a specific resistance that is directly proportional to its length and width. When a force is applied on the load cell, it bends or stretches causing the strain gauge to move with it. And, when the length and cross-section of the strain gauge changes, its electrical resistivity changes, thereby changing the output voltage. What is the Wheatstone Bridge? Whenever the change in the resistance of strain gauge takes place, it is displayed as an electrical output. But, have you ever wondered, how the resistance change of a strain gauge is measured? A load cell works only when the strain gauge has some change in its resistance and, we use the Wheatstone Bridge to measure this change. Refer to the figure below to understand the functioning of a Wheatstone Bridge. Let us assume that a load cell has four internal strain gauges i.e. A, B, C, and D as shown in the image above. The input voltage supplied by a signal conditioner or digital display is attached to the two opposite corners of the bridge i.e. C and D whereas, the output voltage is measured by joining the A and B resistors to the signal side of the digital display. When no load is applied to the load cell (Load=0), the circuit is said to be balanced. As soon as the load is applied to it, the strain gauge resistors will witness a change in its resistance, thereby, altering the voltage flowing through the circuit. Hence, the voltage across A and B will change which will be displayed as the weight on the readout unit or the digital display. The output of the Wheatstone bridge or a load cell is an analogue data which is converted to readable units using an interpreter. They are specially designed to suit the harsh & severe industrial environment. Load Cells are temperature compensated. They have a stable system with no moving parts and linkages. A few of them have multiple strain gages incorporated to reduce positioning effect. Any standard strain gage bridge measuring read-out device can be used with the load cells. To determine the load in rock bolts, tiebacks, foundation anchors, cables or struts. Proof testing and long term performance monitoring of different kind of anchor systems. Compressive load measurement between structural members i.e. tunnel supports or at the junction between a beam and the top of a pile strut. Used extensively for correlating data obtained from borehole extensometers. To determine the load in experimental research, pile testing and measurement of the thrust of rocks. Compressive load measurement between structural members. Measurement of compressive load and axial forces in struts. Determination of roof convergence in underground mines. Primary Axis: The axis along which the load cell is designed to be loaded is known as the primary axis. Axial Load: It is the load applied along the primary axis. Calibration: The comparison of actual load cell outputs against the test loads is known as calibration. 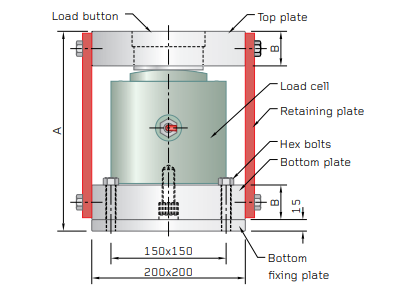 Capacity: The maximum amount of load that a load cell can measure is known as its capacity. Non-Linearity: The difference between the output at a specific load and the corresponding point on the straight line drawn between minimum load and maximum load is termed as Non-Linearity. It is usually expressed in units of %FS. Non-Repeatability: The maximum difference between output readings for repeated loadings while keeping the loading and environmental conditions identical is known as Non-Repeatability. Sensitivity: A sensitivity of 3mV/V means that the load cell produces an output signal of 3mV at nominal force when the input voltage is 1V. This was all about the Load Cells and its different types. If you have any queries, feel free to comment below.